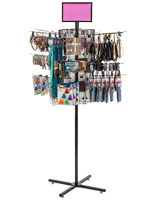 This spinner rack w/ 4” pegs is a compact and sturdy way to display goods for sale. 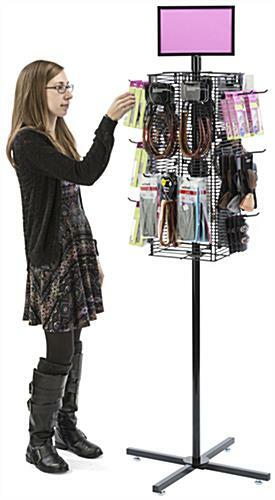 This black powder coated display with (20) hooks can actually be adjusted to fit different types of merchandise. This spinner rack w/ 4” pegs, also known as a wire display stand, has a tier system and four wheels for easy transport; four levelers keep the presentation stable. A top loading removable header advertises new items, or sales, handily. 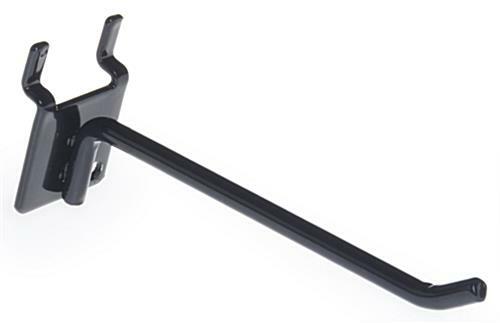 This rack with 4” pegs is perfect for rack hole packaging. Customers can view items from all sides of this wire display grid. The design of this black tier stand allows many items to be stored and enjoyed at once. 20.0" x 56.0" x 17.5"